Google offers a custom news feed according to your defined preferences. Many other players in the field are doing this, Zite, Flipboard, and now Apple. But Google has some weight here, because y’know, they are Google. For the past couple months, I’ve been fine-tuning my “Suggested for you” feed in Google news. Telling Google I’m not interested in Staples, Subway, and United Airlines. 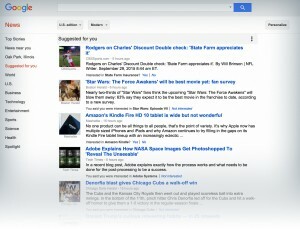 And giving Google News a thumbs up to things like Star Wars, Post Office, and the Chicago Cubs. The service looked to be really custom. It would pick up on when I would do searches on something and ask me if I wanted to get news on that topic. For my honeymoon, I was googling Aer Lingus. So Google asked me if I wanted news on Aer Lingus (to which I answered no). But then there are positive parts where I googled Adobe, and Google asked if I wanted to follow Adobe news, to which I positively responded. Every day Google gives me 13 stories. Just 13 stories. Sometimes I want more. But the focus behind giving me just 13 stories seems nice. There’s nothing in that URL that identifies the feed as being customized for me. I plunk the feed into my Feedly account. Taking a look through the stories, they definitely are not customized for me. So this must be all the articles that move through the “Suggested for you” section of Google News. Then comes the scary part. Feedly says the feed averages 292 articles/week. Which sounds like a lot. But it’s only 42 articles a day. Only 42. It looks like Google is picking from a total of 42 articles a day to give to people’s “suggested for you”. 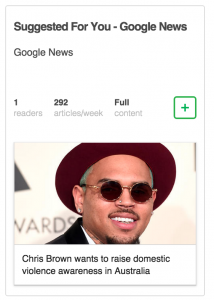 Shouldn’t Google be selecting from thousands of articles? This 42 per day is very suspicious that Google is picking only a select amount of articles–for whatever reason. I just hope the reason is that those particular news items are getting more attention, and thus worthy of being highlighted in the Suggested for you. One positive aspect of this limited pool of articles is that I don’t have to be afraid to answer “yes” I like news about Adobe, because my SFY won’t get overflowed with Adobe articles. Instead Google will only give me the very top news. Adobe certainly won’t have multiple articles in that list every day. If you haven’t tried the “Suggested for you” in Google News, give it a shot. Any news service that lets you customize your feed is worth looking into. Especially when you can customize the exact rules of what you see. I’m looking at you Facebook with your esoteric like button. I want the control of the topics I see. Google News SFY is a step in that direction.